There are some weather phenomena that make you feel warm and fuzzy on the inside, like rainbows or iridescent clouds, and it’s as if everything good in the world has aligned. Then there are other weather events that make you feel like you’re in the middle of a horror movie and the world is ending before your eyes. We’ve already covered eerie winter events and UFO clouds, but buckle up because things are about to get even weirder. Simply put, brinicles are like icicles that occur underwater. When oceans experience freezing temperatures, layers of ice form on the surface comprised of brine, a salt-heavy substance. Brinicles are formed when brine leaks into the sea, sinking and creating an icy finger-like formation. This is how scientist Bruno Escribano describes the process of the phenomenon: “Since the concentration of water in the brine is lower than that in the ocean — and water moves from high to low concentrations, via osmosis — water is attracted to the brine. But the brine is so cold that the water freezes, forming a descending tube of ice.” The underwater icicles can be a threat to small sea creatures that may wander into the extremely cold brine. 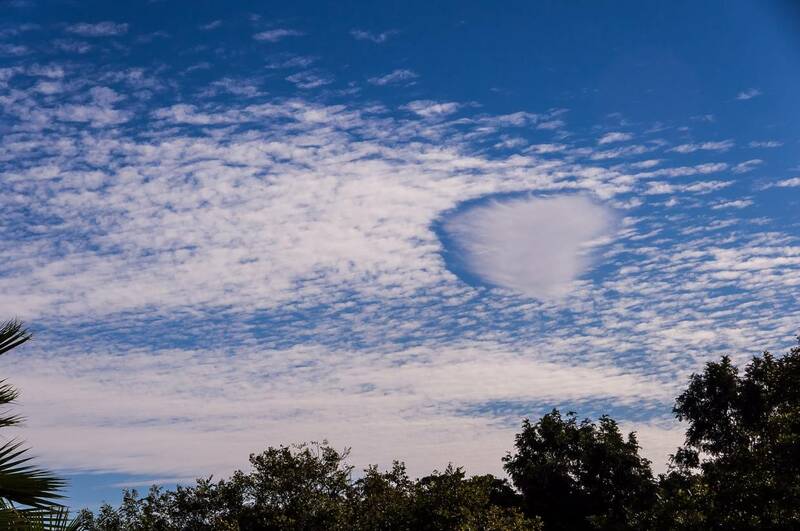 If you’ve ever seen a cloud that seems like it’s missing a big chunk in the middle of it, you’ve probably seen a fallstreak hole, or a “punch hole cloud”. When droplets in the cloud are super-cooled, meaning they’re at a temperature below freezing but aren’t frozen yet, large holes form. How exactly does this happen? According to the Cloud Appreciation Society, “The research has confirmed the long-held suspicion that an aircraft flying through the cloud can be enough to set off the freezing process. The expansion of the air as it passes over the aircraft wings and (for certain types of plane) over the blades of its propellers, causes it to cool. This momentary cooling can be enough to take the temperature down low enough for the droplets to start to freeze spontaneously.” These types of clouds are a rarity, so if you see one in person, consider yourself lucky! Another term for this unique phenomenon is a “dirty thunderstorm”. Volcanic lightning occurs when rock fragments, ash, and ice particles from the volcanic plume collide together and generate a thunderstorm. 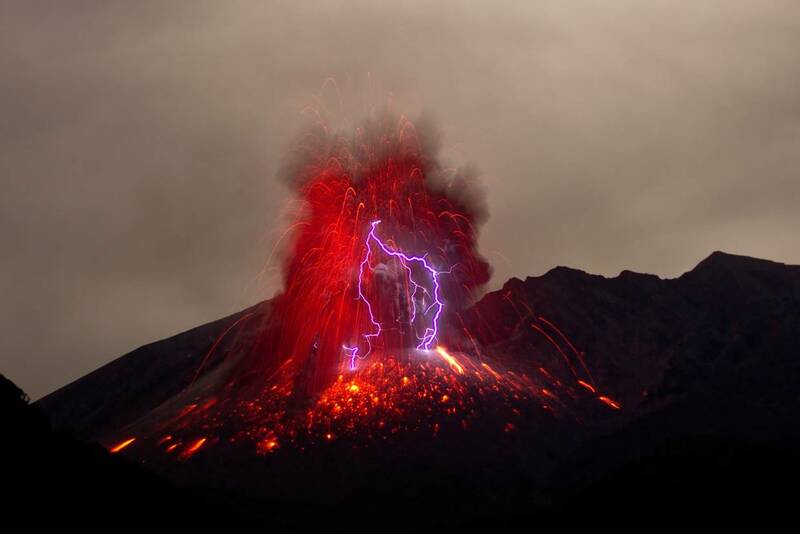 However, there is still a lot of uncertainty about how volcanic lightning forms, since ash plumes are more difficult to study and a lot more unpredictable than supercells. One thing we know for sure is that it’s one of the most ominous and terrifying weather events to witness, and that it’s a weather mystery being researched by scientists across the world. This is as terrifying as it sounds. A whirling storm of fire that’s a rare, but completely devastating event. Live Science describes the formation best: “As hot air rises from the ground, it forms vertical columns, or “chimneys,” until it becomes less dense, cools and then dissipates at higher altitudes. As more hot air is pulled into the rising column of fire, it begins to swirl in a vortex.” Fire tornadoes usually don’t last very long, but they can cause irreversible destruction to whatever lies in its path, as well as begin more fires. Which of these events would you want to encounter the least? Let us know in the comments below! Because it looks really creepy. The one I would least like too see is the volcanic thunder storm. The Brinicles of Death are the saddest and most frightening to me! I thank that all of those are really cool looking. I think the one I would least like to see is the volcanic thunder storm. The fire tornado is the one I’d least like to see. I’ve seen a few fallstreak holes while I drove to work everyday along the flight path for planes coming from Atlanta to our local airport. They are very cool.